Mechanical - Testing Laboratory - Telma S.A. 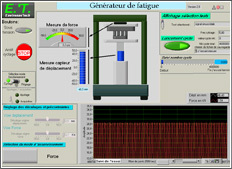 Fatigue tests under alternating loads are a plus in the determination of resistance to breakage for mechanical parts. 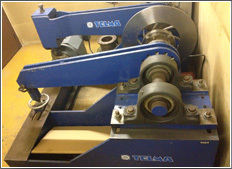 The Telma Testing Laboratory performs torsion tests under torque (shafts, coupling plates, rotors, etc.) as well as repeated compression tests on 35 kN screw jacks for thinner parts (weight up to 200 kg). For instance, using our torsion bench, we were able to validate the fatigue behaviour of a component of the landing gear on the first Airbus aircrafts for SNECMA.